Titled waterfront home with great rental history. This is one of our favorite homes in the area due to its Key West style designed home. It is open and airy, simple and very comfortable. 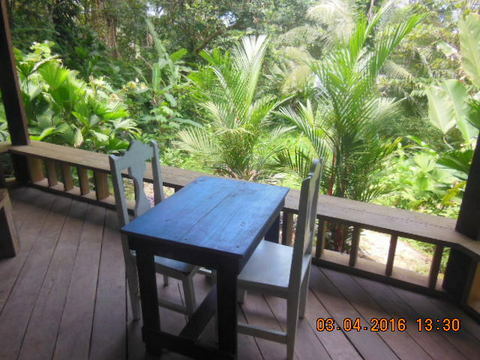 It is located only a 5 minutes boat ride from Bocas town and once you are home you are on another quiet island away from the hassle of town life. There is a 12 foot wide wrap around veranda which is where you spend most of your time, when you live the island life. Just inside the double doors is the dining room, galley kitchen and living room area. On the back side of this are the two bedrooms with a shared bathroom between. A spiral staircase takes you upstairs to an open loft, with two single and one queen bed. On the ground floor is a large storage area with a shower to use after your water sports. This storage area is now used for a wash machine, kayaks, snorkeling gear and a back up generator. This area could easily be converted into additional living area. This titled home is off the grid like 95% of all homes in our archipelago. The home has a new solar system, water pump and rain catchment water tank. The home has recently been freshly painted, woods refinished as well as complete new furniture, linens and kitchenware.The sale of this house is completely turnkey, everything is included. It is waiting for you to move in or bring in the vacation renters. The house sits on a lot of 686.36m2 with a 45 meter or 147 foot waterfront. The cement dock has a thatched roof rancho and a concession of 1177,76 m2 area. You could easily apply for a larger building in this over the water area.